I'm headed for Slapsticon in Arlington, VA this summer. Four days of vintage comedy unspools July 15-18 at the spacious and comfortable Rosslyn Spectrum Theatre. Don't know about the rest of you attending, but I'll need this break from habitual solitary viewing. Where comedies are concerned, that's exactly the wrong way to watch. How are we to judge what's funny sitting alone with our televisions? Slapsticon is a needed corrective to the hermit's life so many enthusiasts pursue. Kindred spirits there are eager to share Johnny Hines, Snub Pollard, and the Dippy Doo-Dads (who among my local acquaintance will sit for obscure, but eminently worthwhile, likes of these?). I'll be interested in seeing how such clowns play in a large auditorium before several hundred viewers. They say laughter is contagious with a crowd. I know that's true from experience, though in my case, there's not been enough such experience. This year's is the seventh Slapsticon. A number of hotels are convenient to the Rosslyn with abundance of good restaurants nearby. It's worth noting that this venue, where all of Slapsticon's screenings take place, has cushioned seats in a spacious auditorium (crucial data for those embarking upon four days looking at movies). Slapsticon provides by far the most lavish and informative program book of shows I attend (these being definite keepers for reference and repeat reading pleasure). If we're to appreciate classic clowns, surely the best way is in an environment like this, where prints are of optimum quality and presentation is of consistently high standard. There is really nothing like live musical enhancement when you're watching silent film. Good as many are, I'll forget a two-reeler on DVD within days of looking, but in-person performances enter the memory to stay. Slapsticon gathers the best of such accompanists to provide that extra something you get when music is happening here and now, just like when Golden Age comedies were new. I expect to make numerous discoveries at Slapsticon. Clowns barely known to me will likely rise higher in estimation, thanks to hospitality of a large screen and enthusiastic audience. Monty Banks, Lupino Lane, and Billy Dooley are faces I've not seen enough of at home. I expect the three, plus favorites of longer standing, to make large impression at Slapsticon. There is always revelation where rare film gets an airing. Most of what's on Slapsticon's program has been little, if at all, seen elsewhere. Organizers try to avoid stuff readily available on DVD. 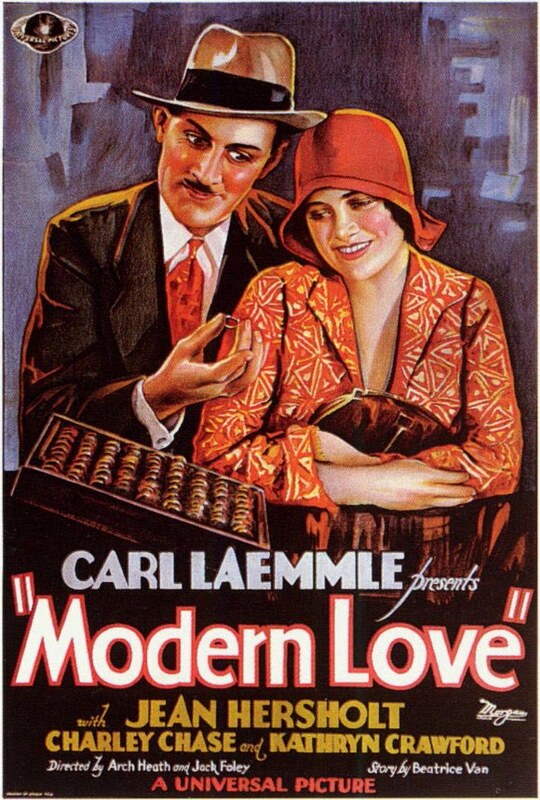 I'm really stoked for Modern Love, a Universal part-talking feature with Charley Chase, and there's old favorite Africa Screams in 35mm. This will be my first Abbott and Costello in the larger gauge, and I look forward to it. 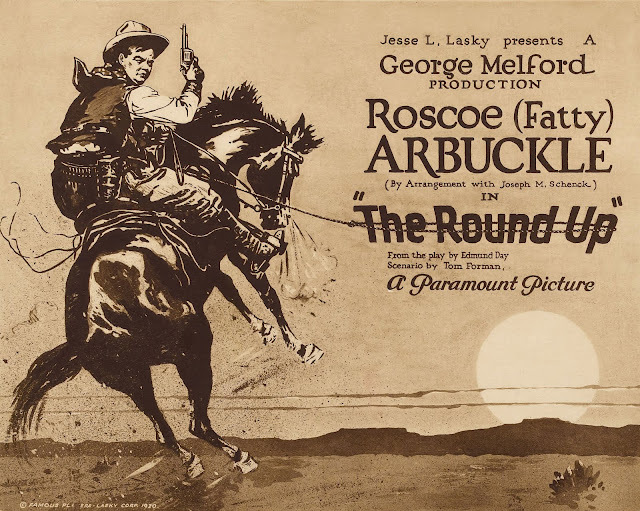 Plus we'll see Roscoe Arbuckle in The Round-Up and several Harry Langdons new to me. They're showing cartoons as well. Show coordinator Richard Roberts tells me there's a 1913 Vitagraph called The Fuedists scheduled, which he describes as sort of an early Mad, Mad, Mad, Mad World, featuring all of Vitagraph's star comics of the time: John Bunny, Sidney Drew, Flora Finch, Wally Van, and Hughie Mack. Where else would you see something so scarce and offbeat as this? Another thing recommends Slapsticon that I'll mention. Virtually all those producers behind recent DVD comedy collections will be there. 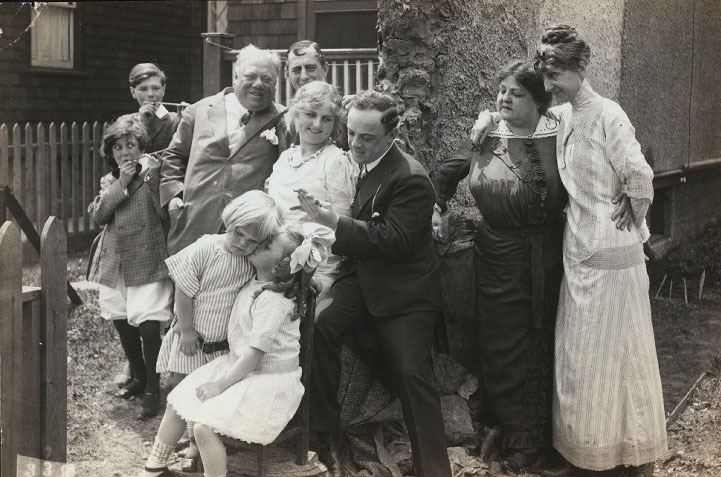 This includes folks we can credit with multi-disc sets on Keaton, Langdon, Arbuckle, and Chase, as well as volumes so far released of American Slapstick, the much applauded clowning compilation(s) that has brought so many shorts and features out of hibernation. Contributions these people have made toward rescue and revival of classic comedy have been an ongoing highlight of DVD collecting for me. Some among these are furnishing surprises to be added to an already burgeoning line-up, among them at least one eye-opener that promises to set a new bar for rarity. I'm told there is still lodging to be had near the Rosslyn (focal point of Slapsticon activities), but reservations should be made soon against likelihood of vacancies eventually taken. Attendance has increased with each year of this show, a reflection of how much participants are enjoying it. Great post John! I'd like to also add that the place where the screenings are held, The Spectrum Theater is also AIR CONDITIONED as July in the DC area tends to be VERY hot. I can't wait for it and I'll see you there! It just sounds wonderful! What a fun-filled 4 days. Enjoy and will be waiting to hear all about it! If the AFRICA SCREAMS print is the one I think it is (restored by A&C historian Bob Furmanek), you're in for a treat. Not a great film, but a very nice quality print off of the camera neg. I've been to all six Slapsticons so far, and WOULD NOT miss it! It will be nice to see you there, John. MODERN LOVE is a gem. It's not the funniest Chase ever, but seeing Charley showcased in a well-crafted feature makes you wonder why Roach wasn't better about doing same. 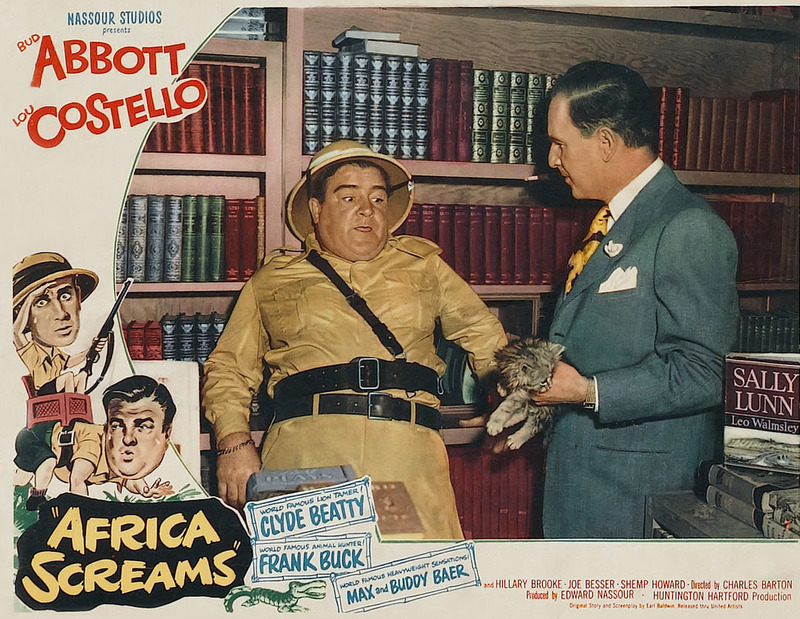 I will be hosting the Abbott & Costello Rarities program and, as Jack suggested, it will indeed be Bob Furmanek's beautiful 35mm restoration. Be sure to stay for the entire weekend as we will be screening some new discoveries (unscheduled)which shall thrill and astound! I always hear about these festivals either after they are over or without enough notice to attend. 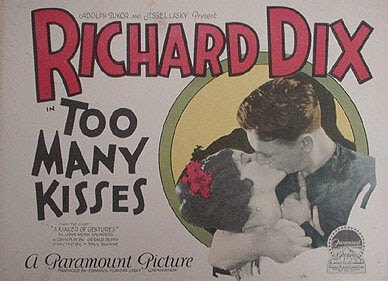 At some point could you post a listing of festivals for old movies? I know there is Cinecon. There must be others, and I would like to start attending them. Our neighbor and my parent's great friend Allan Hersholt talked to me about "Modern Love" with his father Jean. It's a dim memory. In one of the main rooms at The Masquers' Club in Hollywood hung an enormous oil painting of Charley Chase who had been a past president. Allan, who later beame President himself, and was known to gurgle a little seltzer late at night for digestive purposes, used to tell me of being alone in that room late at night by himself and Charley (and Lou Costello and Alan Mowbray -- all past Masquers' Presidents and also on display there), would be talking to him, and I didn't -- and don't -- doubt it for a moment!